Nov25 by John M. Buol Jr. The US Army Reserve has been a dominate force in international marksmanship competition and the team continued its winning ways at this year’s Armed Forces Skill at Arms Meeting (AFSAM.) Hosted by the National Guard Marksmanship Training Center in Camp Robinson, Arkansas, AFSAM is an International shooting competition open to all NATO countries that began in 1991 with three countries and 49 participants. AFSAM 2010 consisted of 18 formal teams, with several more shooting for honors, and competitors hailing from seven countries. In addition to US Army Reserve and National Guard teams from the United States, shooters from Canada, Australia, England, Netherlands, Denmark and Norway competed in this year’s events. USAR shooters started strong in the nine individual events, taking seven first places, five second places and five third places. In the overall individual rifle aggregate, USAR team members took gold for first place and four of the top ten places. In the individual pistol aggregate, USAR shooters took first through fourth and secured six of the top ten places..Most impressively off all, USAR team shooter MSG Lance Espinosa won first place overall in both rifle and pistol matches. Putting this philosophy to practice USAR teams took five first places, two second places, and four third places, earning trophies in nine of the ten AFSAM team events. 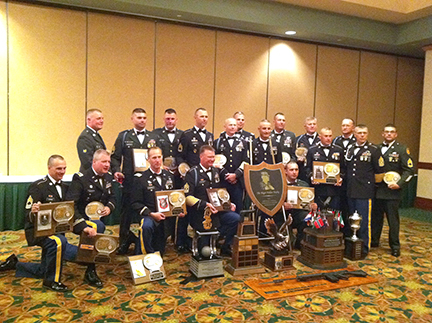 This culminates with each country competing for the Lexington Green Trophy, a grand aggregate comprised of the International Service Rifle match and Close Quarter Battle match. The first is shot from 100 to 500 yards and ends with a run down, shooting at every yard line from 500 back to 100, which the USAR team finished with a 28 point lead. The Close Quarter Battle started with casualty evacuation and ammo resupply exercise, requiring teams to run with two litters each loaded with 150 pound “casualties” and sprint to the firing point with eight 30 pound ammo cans. Shooters then fire four stages of a close quarters battle course culminating with a CBRN drill shot in protective masks. Despite the physical demands the USAR team finished 93 points ahead of the next closest team, taking the Lexington Green Trophy and the overall AFSAM win.